Being that May 15th was National Hummus Day, and I love hummus it felt natural to do TV segment sharing the awesome ways to use hummus. You know, other than the obvious carrots and pita. Don’t get me wrong, I have baby carrots and hummus in my fridge most of the time, for a quick snack, but it is fun to see the different ways to use what is a healthy, filling alternative to mayonnaise. I’ll be sharing these recipes over on KATU AM Northwest Tuesday May 27th between 9-10am. Here is the segment! 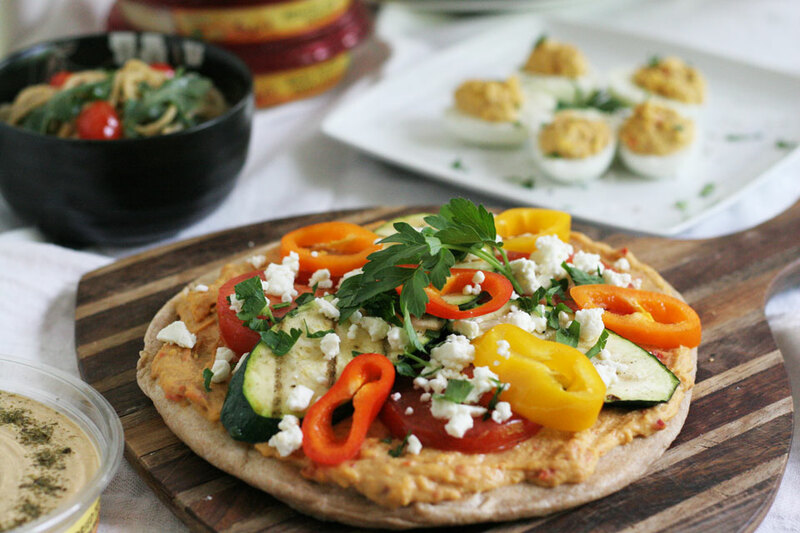 I shared my recipe for grilled vegetable flat bread with hummus. I also shared a recipe from my friend, Heather from Farmgirl Gourmet. She is also a Sabra Tastemaker and her recipe for falafel using hummus is delicious. 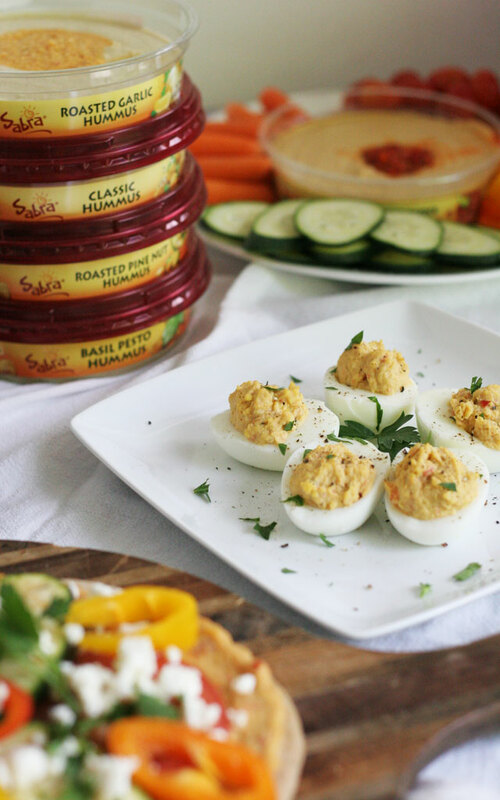 Here is the recipe for the deviled eggs I shared, it’s from the Sabra website, where you can find a gang of awesome ways to use hummus, other than dipping. A pretty cool way to use it, is making a pasta sauce with it too, I’ll be sharing that recipe in the coming weeks, but you can see a snap shot of it in the AM Northwest segment. It was tasty, unique, and healthy. Some other classic, but more interesting ways to use hummus instead of mayo is on sandwiches, wraps, and as a sauce. For more ways to use Sabra hummus, check out their Facebook page too. It’s full of great recipes! 1. Get the grill hot, I grilled the vegetables over medium high heat. Place the zucchini, tomato, and peppers in a large bowl. Add the olive oil, salt, and pepper, toss to combine. 2. Place vegetables over direct heat/flames, grill for 2-3 minutes each side. Remove from heat. 3. 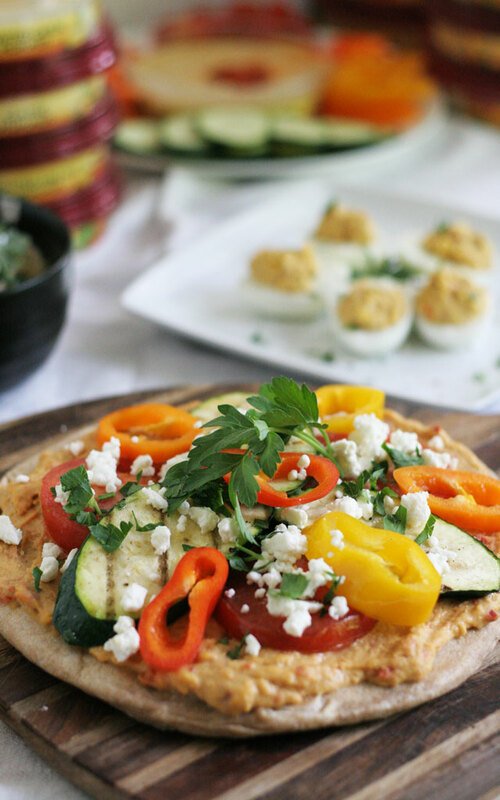 Spread 1/2 of the hummus container on each flat bread first, followed by sliced tomatoes, zucchini, and peppers, sprinkle crumbles feta all over pizza. Slice into 8 slices, and serve immediately. Disclosure: I was paid to do a TV segment for Sabra Hummus. But this post is not sponsored. I wanted to share the things I shared with the TV viewers with you, my readers. All opinions are my own, as always. Didn’t think about using pita bread on the grill – easy way to make grilled pizzas. Love it! Thank you! I hope you like it :). I’ve been loving flatbread and hummus lately, but I want to expand my creative use of these ingredients. I really love the way that this flatbread vegetable pizza looks, and it doesn’t seem too difficult to make. I’d love to give this a go for my lunch tomorrow, thank you for this recipe! Thank you, I hope you like it! Thank you, I am happy it helps! Thanks for the recipe! Great idea to use flat bread as the pizza base and hummus as the sauce. Thank you, Liz! My pleasure. It is really good, I love using hummus in place of so many things!